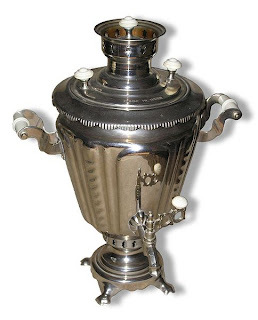 Oh, my grandparents used to have a Russian samovar similar to this gorgeous one and the cups too! So pretty! 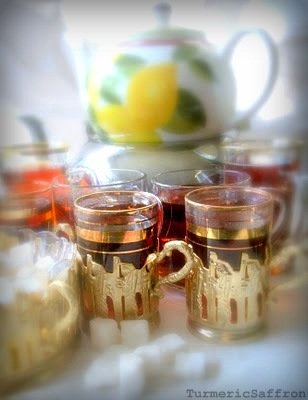 You know I discovered Persian tea in California through Persian friends and I thought it was wonderful! I loved the tea, the samovar, the whole experience! I learned since then to be demanding when it comes to tea! 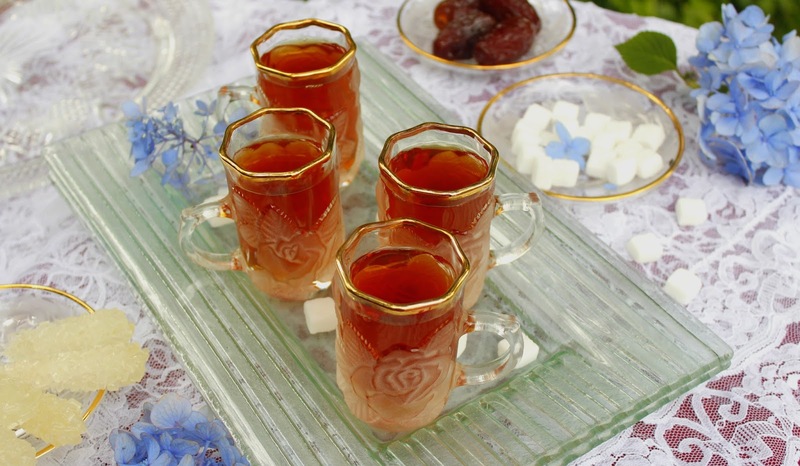 Because the best tea is Persian tea, made the right way, which is not always the case! Thanks for a great post! bentobird, Thank you, that's very kind of you. This is my first award and it means a lot to me. 5 Star Foodie, my grandparents had a samovar too. we used to have one but rarely used it. Taste of Beirut, thanks, I love the tea and the whole experience too! Oh, how I adore tea! Though I do admit to sweetening mine ;-) Thanks for your lovely post. Love the tip about warming the teapot with some splashes of hot water. I'd never heard that before, and plan to try it soon. A very informative post on tea. It is also so popular here in Turkey. It is a tradition to serve tea at breakfast and after lunch and dinner. And the aroma of tea brewed in semaver is irresistible. azita, i like the way you gave us a historical background about tea as well as shared stories from your culture. these sort of posts which reveal things about one's personality are my fave! i like my tea w milk and a cardamom, but also, the way you do- which is strange, right? pakistanis only drink tea w milk. but i started drinking tea like you do bec of an Arab friend who used to drink tea this way- and i loved it. i love this post v much, Azita jan.
Zerrin, thank you for stopping by and commenting, it's so nice to see you here. Shayma jan,thank you so much my dear. Can't tell you how much I love your website. I was born in Iran and lived there until I was about 8yrs. My mother is American so we mostly lived here in the states. I remember my grandmothers cooking (my mother never could get the hang of cooking Iranian dishes, LOL) and still crave it to this day. I've tried to find recipes online but am never sure what I am making since I can't remember the names to the dishes, so your site has been such a blessing, I love that you have pictures with the recipes, now I can see and remember what my favorite dishes use to be. Tonight I'm fixing "Shevid Boghali Polow" YUM my favorite. I do remember one thing and that was how to make the steamed rice. LOL Wish me luck. Tina C., Thank you so very much and I'm very glad you found this blog! It's wonderful that you know how to make rice the Iranian way, the rest is easy! Best of luck and enjoy the shevid baghali polow! 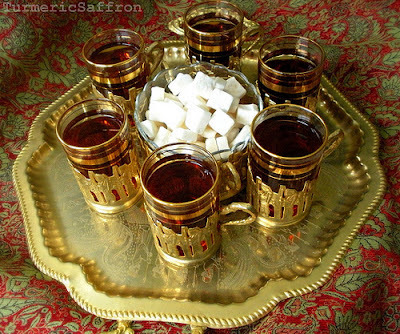 My husband had Iranian tea with friends from Iran, and loved it. Finally, after 7 years (in South Africa) we managed to get our hands on Iranian tea, however my first attempt was not great. The tea turned out extremely bitter, however my husband says that he does recognize the flavor. I will definitely try your instructions, and hope I get it to taste better this time around. I love you blog and all your wonderful recipes. I have the good fortune of having Iranian friends in Chicago. My fondest memories is of spending many evening with them and always walking in the door and being handed a cup of tea and their wonderful hospitality. The mother made the most delightful food and as an American from the Midwest it was a change for the food my family ate. Azita, where did you get your beautiful tea cups? I am looking for a set for a gift for my father! I also love that gold platter you used as well. Thank you! Laila jan, this tea set and the gold platter were gifted to me by a family member from Iran. What a great article and such a nice insight into your long tradition of tea drinking. I was wondering. 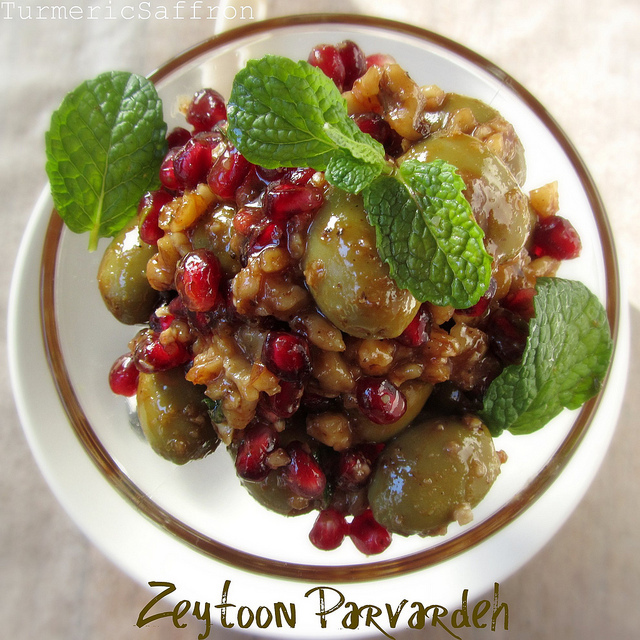 If you serve tea with cardamom how would you name it in persian? is it Chai b hel? I would like to impress my persian frineds. Jama, yes, the name would be chai ba hel in Persian. Thank you! Ya Allah this looks good. Persian tea is my favorite right after Turkish :) But the tea we have here in Saudi is just not the same I used to be able to get it in the states :( Where can I get the right blend online? Noor, you can try amazon.com for premium loose leaf black tea. Wowwwww only came across your website yesterday & i'm soooooooooo happy that I did... your work is great :-)) pictures, history and great easy to follow recipes! 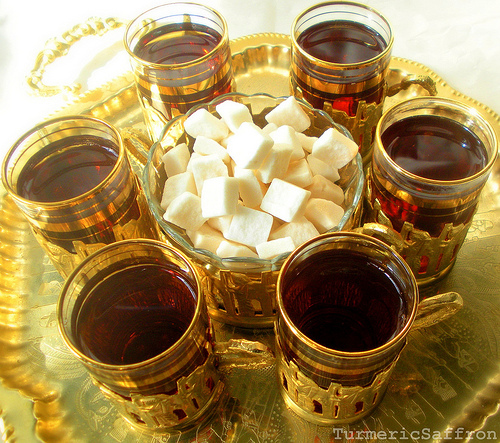 One question for the tea... we have Ahmad tea, what's the best brand of tea to follow exactly how you would make it? Layla jan, I like Ahmad tea too. Thank you very much for your kind words! What do you usually eat with tea? Do you have an Iranian counterpart of scones? Traditionally tea is served with sugar cubes and other sweets. Where can I buy SHabazz tea online? My friends from Iran (in Los Angeles) turned me onto it and since I returned to the east coast US, I can't find it anywhere!!!! Viki, I had never heard of this brand before. You say the tea should be brewed in a china/porcelain tea pot. What do you think about brewing tea in a transparent tea pot? (the type made out of glass/plastic). Will the tea lose its taste? Hi, porcelain/china teapots are classic and have been the most commonly used teapots in Iran. I don't think using the glass teapot would change the flavor of the tea and therefore I don't see a problem with using it. What is the white thing in the first picture? I find this very interesting myself. I am a recent devotee to various tea. Chai and more recently Market Spice. A friend recommended Iranian black tea. This caught my attention immediately as I've always had a underlying interest in just anything Persian. Decades ago I met Iranian political refugees while serving in another middle eastern country. I was very impressed by them; polite, very well spoken, neatly dressed, family oriented persons. It would give me some joy to have a tiny little piece of thier cultural best.